Live onstage at CES 2016 in Las Vegas, chip-maker Qualcomm debuted its new in-car processor, the Snapdragon 820A to accompany the Snapdragon 602A it introduced at CES in 2014. The 820A is the crown jewel of the two chips. It’s smart, fast and utilizes both GPS and the Global Navigation Satellite System (GLONASS) with a single custom 64-bit CPU core. 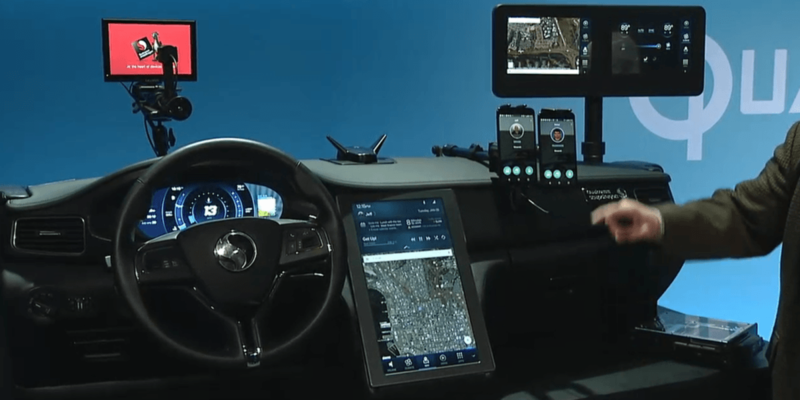 In an awe-inspiring demo on a mock car dashboard, which had a 4K touchscreen tablet at the center of the dash as well as a beautiful cluster display in the typical spot for the instrument panel, two connected smartphones and two tablets all running different technologies, at the same time — all running on the 820A. In the demo the 820A rapidly switched between movies, navigation, a 3D Google Maps view and even swapped out user profiles from a blue customization to a red one as one driver exited and another entered. The infotainment system was completely voice-activated and had smart algorithms for real-time noise cancellation and reduction. In a noisy room, the system was still quite precise with commands. Connectivity was also key. Qualcomm’s partnership with Audi extends to the automakers’ ‘Audi Connect’ infotainment system. Audi Connect will support LTE-Advanced in its new automotive line and feature download speeds of up to 600Mbps, a much-needed speed boost for a processor fast enough to handle whatever you can throw at it, all while running multiple technologies concurrently. Audi’s new system features sophisticated machine learning algorithms (running on the 820 processor) that detects multiple types of lane markings and can alert you to things like speed limits and obstructions all while updating in real-time as new information becomes available. The in-car system aims to offer additional safety measures in addition to its plethora of infotainment options. The most notable one was a system that detects when you’re driving distracted, which is the cause of most automotive accidents. Now, as you look away from the road, the cluster unit lights up with a warning that you’re driving distracted and presumably crosses its digital fingers that you’ll start paying better attention to the road. While it’s unclear when Audi owners will be able to future-proof their new cars with the 820A, the Snapdragon 602A is scheduled to launch in Audi’s new A5 at the end of the year and in more models in 2017.